﻿ France - Biking around the Mount Saint Michel and the Emerald Coast. From Brittany to Normandy, this easy biking tour starts in Saint Malo along one of the most beautiful coast of Brittany, the Emerald Coast. Discover the Mont Saint Michel, surrounded twice a day by the largest tides in the world that rise up at the speed of a galloping horse, a magnificent natural spectacle well-known since the Middle Ages when pilgrims used to come to the Abbey. This bike tour is a balanced combination between the typical fishermen ports of the coastline and the hinterland in the Coglais area with the traditional granitic houses. Arrive in Saint Malo, the corsair city, the departure point of great transatlantic sailboat races such as the “Route du Rhum”. Bike along the Rance River and Saint Suliac among the nicest villages of France. Head toward The mount Dol, a 65m mount that culminates over the Polders Plain where there used to sit a gallo roman temple dedicated to Jupiter . 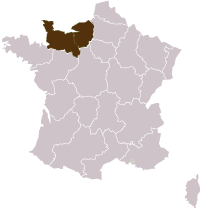 Southeastern route toward Fougères, the impressive Menhir of Champ Dolent, the Villecartier Forest filled with oaks and history . End of the riding day on the Green lane and following the former railway. Dinner and night in Saint Bris en Cogles. Loop ride around the Coglais and Fougères area, the fortress and the forest. 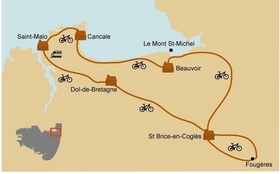 Ride nothward to the famous Mount Saint Michel Bay, via Saint James, Pontaubault and the Selune Valley. Dinner and night near Mont St-Michel. Visit of the Mont Saint-Michel and crossing of the polders. A day between beaches, capes and the oyster harbor of Cancale. Cancale-Saint Malo - 25 km / +-110m - A day between beaches, capes and the oyster harbor of Cancale, Cancale,the jewel of the Esmerald Coast just in front of the Saint Michel Mount, has a great sailing tradition. The fishermen used to leave their city during 7 months to join Terre Neuve and come back with their boats filled with cod. A day between beaches, capes and the oyster harbor of Cancale, Then pedal to Pointe du Grouin and Saint-Malo, the corsair city of Surcouf. Give back the bikes and spend the night in Saint Malo. 715 € per person for 7 nights in double room. The bike rental : 95 € per 6 cycling days. Electric Bike rental : 140 € per 6 cycling days. Half board (breakfasts and dinners) except day 1 and 7 in Saint Malo (drinks excluded). One road book with the description of your program and full detailed. The trip to St Malo. Dinners on day 1 and 7 in St Malo. Everything else that is not listed under "Price includes"
2 star hotel - Half board . One road book with a map. Starts in : Saint Malo. Ends in : Saint Malo.